volunteer work and Africa, volunteer work, Africa, volunteer, work Africa, CID-Ghana, Cooperation for Integrated Development Ghana, is a development organization based in Tamale of northern Ghana. CID acts in two main ways, through development projects and through creating a direct link between Ghana and other parts of the world. The web server used by Cidghana.org is located in Copenhagen, Denmark and is run by Surftown A/S. This web server runs 4 other websites, their language is mostly english. 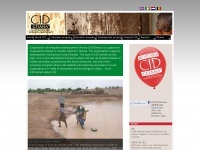 The Cidghana.org websites were developed using the programming language ASP.NET and served by a Microsoft-IIS server. XHTML 1.0 Transitional is used as markup language on the webpages. To analyze the visitors, the websites uses the analysis software Google Analytics. The website does not specify details about the inclusion of its content in search engines. For this reason the content will be included by search engines.